The Thai Style Pumpkin Soup brims with multiple flavours, ranging from the spiciness of red curry paste to the pungency of onions and garlic. Vegetarian seasoning cubes make the aroma of the soup surge high, while coconut milk gives it the characteristic Thai touch. Serve this soup hot, garnished with coriander and seasoned with salt. One of Thailand’s most famous soups, the Tom Yum Soup is famous for its unique spicy, sweet and sour flavour. An assortment of veggies adds more volume and crunch to the soup, which derives its fantastic flavour from a combination of ingredients like spring onions, ginger, pepper and herbs. Although it is a wonderful addition to the menu on any day, the Tom Yum Soup with Mushrooms and Baby Corn is sure to be all the more enjoyable on a cold and rainy day because of the abundance of ingredients like lemongrass, ginger and pepper, which soothe and rejuvenate your body. 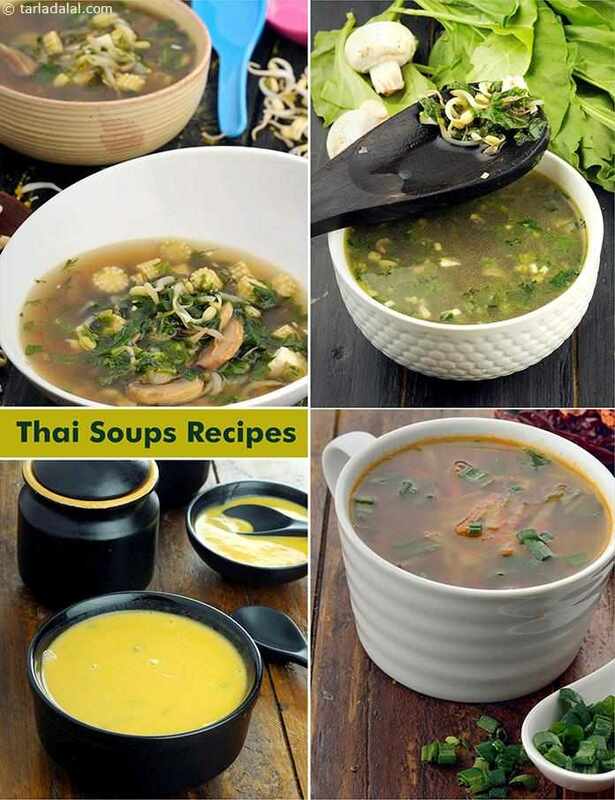 A novel soup recipe, lemongrass and chili soup is a vegetable soup with a difference. The lemon grass and chili combination is unusual but in the soup tastes great. A perfect winter soup recipe. It is a spicy pumpkin soup, thai red curry paste adds the spicy flavour to the soup.